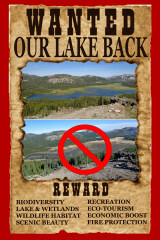 Now that Truckee Donner Land Trust (TDLT) has submitted their application to Nevada County for their project to drain Van Norden Lake and wetlands (see this link), and now we can see what their strategy resembles the current dry Van Norden lake bed, NOT PRETTY. There is a maneuver that developers like to use when they are trying to develop environmentally sensitive land and want to minimize environmental scrutiny. It is called “piecemealing”. The typical scenario is there is an environmentally sensitive piece of property in which there is a part of the property that is particularly sensitive like a lake or wetland. The developer will re-parcel the property to isolate the very sensitive area so that they can avoid environmental review of the rest of the property. In the case of Van Norden Meadow, TDLT has carried this to the extreme. As everyone knows the remnants of the Van Norden dam cause the small Van Norden Lake to form from spring runoff every year. The result is a 80 acre lake surrounded by 90 acres of wetlands. So the dam which sits on about 3 acres of land that effects the entire catch basin behind it of about 170 acres of lake and wetlands. It makes sense that a project that will drastically affect the status of the lake and wetlands should receive a thorough ecological evaluation as is the intent of the California Environmental Quality Act (CEQA). 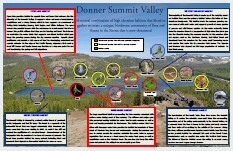 You would also expect that the draining of the lake and destruction of sensitive lake and wetland habitat would not be in keeping with maintaining the environmental quality of the Donner Summit Valley. So how do you get such a project approved? You “piecemeal” it. 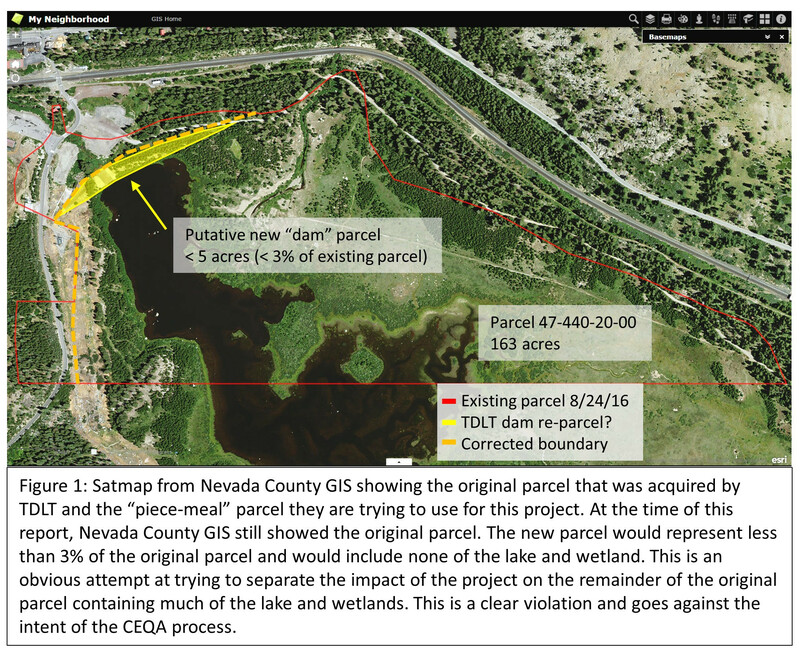 In an effort to avoid the thorough environmental evaluation that this project demands, TDLT is attempting to avoid it by re-parceling the original Nevada County parcel that contained the dam, lake and wetlands into two separate parcels as shown in Figure 1. The motive in piecemealing out the 3 acres of dam from the lake and wetlands is obvious when you read the supporting documents for their project. They are trying to pretend that their project only affect the 3 acres of dam and avoid the scrutiny of the affects on the remaining 160+ acres of sensitive habitat. So when they answer the Nevada County questionnaire question of whether there are any environmentally sensitive areas like lake and wetland or if there are any special status or threatened species they can say “NO”. Fortunately, this type of maneuver is well known and there is plenty of environmental case law ruling against it. We have brought this issue to the attention of Nevada County in our Opposition Report (see this link) and would expect that it will be addressed by the County in their evaluation of the application. It is very disheartening to see an organization whose mission it is to conserve natural resources like Van Norden lake and wetlands to resort to tactics used normally by developers to exploit these resources.